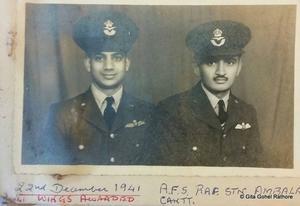 A rare photograph of two MiG-23MFs escorting an Antonov-12 in the Himalayas in the mid 80s. 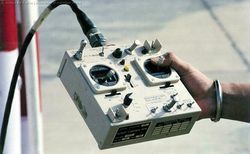 The MiG-23MF aircraft have since then acquired the low visibility grey scheme as can be seen in this picture. 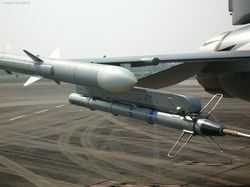 A MiG-23MF launches a R-23R (AA-7 Apex-A) air-to-air missile, against a simulated BVR target. 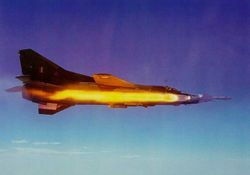 A MiG-23MF, from the No.224 Squadron, in flight over Jodhpur. A visiting MiG-23MF (SK427) at Lohegaon AFS, Pune. 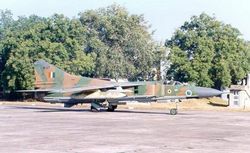 A visiting MiG-23MF (SK427) at Lohegaon AFS, Pune. 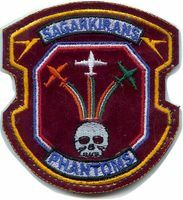 This MF belongs to No.224 Warlords Squadron. 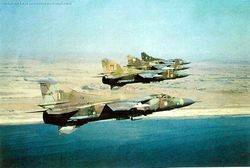 The squadron is due to retire its MiG-23MFs some time in 2001. 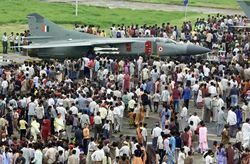 MiG-23MF of the Warlords Squadron (No.224) seen at IAF Day celebrations (Year unknown) at Palam. 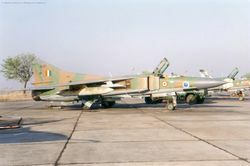 MiG-23MFs from the No.224 Squadron, in the two tone camo scheme parked at an airfield. 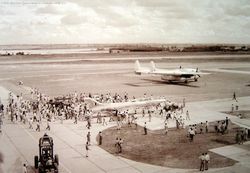 Note the Maritime Jaguar aircraft in the rear, whose fin can just be made out. 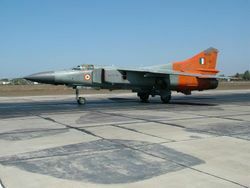 One of the rare public appearances by a MiG-23MF was SK-433 during an airshow at Jamnagar. MiG-23MF (SK436) of the Warlords in flight. MiG-23MF (SK436) of the Warlords in flight. The Warlords are currently relegated to a target tug role. 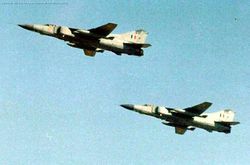 Four MiG-23MFs of No.224 Warlords Squadron in flight. SK436 being the one closest to the camera.